On February 17th, at 1 pm in Room 330 of the Art Building at LSU, the Digital Art and Design Association held a workshop instructed by DADA President Kytana Le and Vice President Jabari Newton. 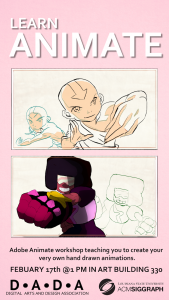 Club members learned how to animate by hand in photoshop and flash. 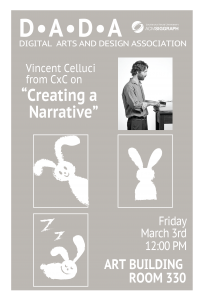 On March 3rd, at 12 pm in Room 330 of the Art Building at LSU, the Digital Art and Design Association held a workshop instructed by Vincent Celluci from CxC on “Creating a Narrative”. Vincent talked to our club members about creating good storylines and plots, what exactly a narrative arc is, and described the pipeline when creating a feature film. This entry was posted in Events on March 6, 2017 by Emily Hargis.